Fresh. Healthy. Local. Grassfed. Pasture raised. 100% Angus. Jersey Fresh. All natural … there’s LOTS of good reasons to eat VonThun’s homegrown Angus beef! (Did we mention that our beef is super healthy?! You can actually taste the difference!) Our cattle are Fullblood and Purebred Aberdeen Angus … a breed well known for it’s natural marbling and tasty, tender, flavorful meat. We currently offer our beef three ways: a la carte, as CSA Beef Shares, and in BeefBoxes. Our a la carte beef is available in our farm markets, May through October. In our off season, we offer Beef Pick Up days (visit our website calendar at VonThunFarms.com for days & times). Our a la carte beef availability can be found on our website. 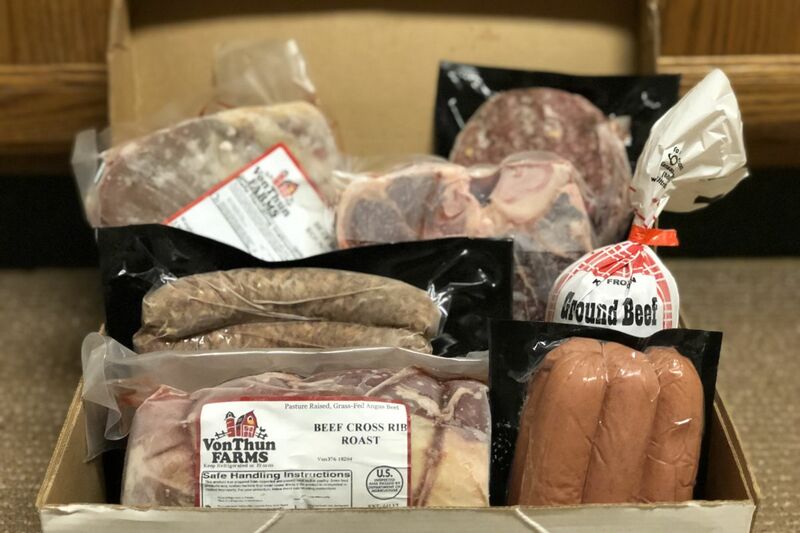 BeefBoxes are an alternative for folks that want to purchase a variety of our beef in bulk at their convenience. BeefBoxes are available year round, as 15 and 25 pound packages. BeefBoxes include the same beef variety as the CSA Beef Shares. We’ll supply everything you’ll need to make your own fresh evergreen Christmas decorations. We’ve got ribbon in every size, shape, & color … and plenty of festive add-on ornaments to match. Have your own ornament/decorations you’d prefer to use? Great … bring them along and add them to your wreath! 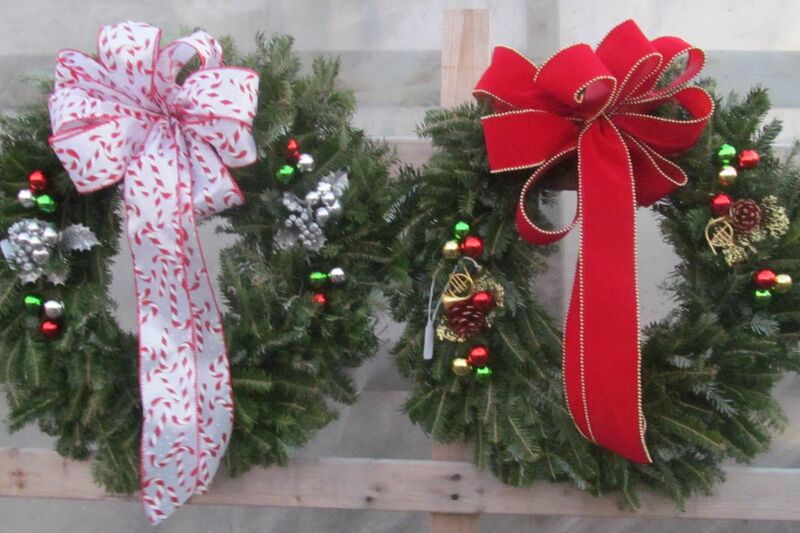 12 CLAMP WREATH: Will finish to be approximately 20″ … perfect for your door. ($20, includes bow of your choice). Decorations are available at an additional cost. Choose as many or as few as you want, or bring your own. 14 CLAMP WREATH: Will finish to be approximately 24″ … a little bigger wreath – great for a front door! ($23, includes bow of your choice). Decorations are available at an additional cost. Choose as many or as few as you want, or bring your own. Classes meet at VonThun’s Farm Market, 438 Route 57 West, Washington. There is no heat in the farm market … dress warm in layers rather than heavy coats, so you’ll be able to freely move about while working. When working with evergreens, your hands may get sappy. Bring gloves if you prefer. If you have a set of pruners that you’re comfortable using, bring those along too. If not, we’ve got them for you to use. Choose your special Christmas project from our list above. Space is limited. A $20 non-refundable deposit will reserve your class spot … SIGN UP HERE. Deposit will be deducted from your project total … final project cost will be determined upon project completion, & must be paid at the end of class. Cash, personal checks, Visa, MC, & Discover accepted. Although all projects are made with fresh evergreens & will last through December, centerpieces are best made closer to Christmas to keep them fresh since they’ll be used indoors. We’ve got some special deals just for you … $AVE at both farm locations!! Take advantage of all three of our special deals … they’re available at both our South Brunswick & Washington, NJ farm locations. AND they’re super money saving opportunities for you as well! Membership in our CSA program promises you’ll be eating fresh, eating healthy, & eating local for weeks in 2019. Pick up your share at the farm or have it delivered to one of our host sites! CSA Shares make a great holiday gift … a gift of healthy eating that will last for months! 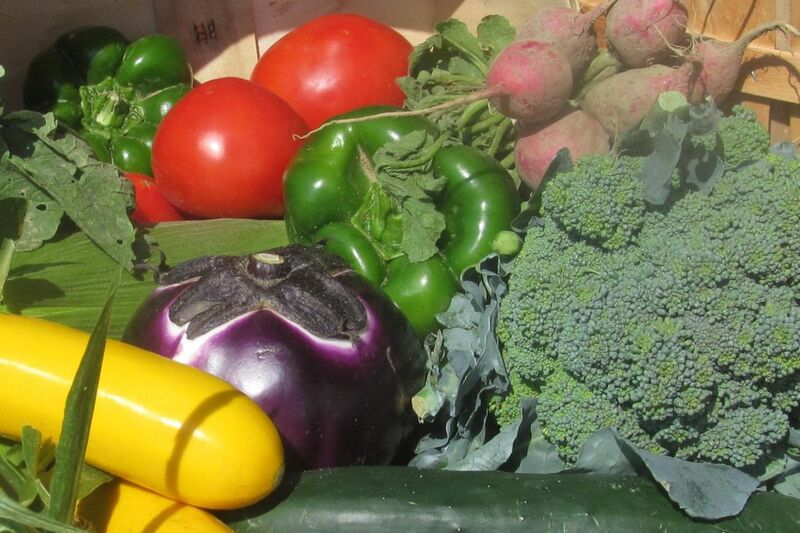 Full, half, & personal Weekly Veggie Basket shares available starting at just $245 per season! Program starts in Spring 2019. Buy your passes NOW and be ready for our 2019 events at both VonThun Farm locations! FREE hamburgers or hotdogs with the purchase of any BeefBox. Homegrown, pasture raised Angus beef…Taste the difference! From our pasture to your plate … eating fresh, healthy, & local has never tasted so good! Cut down on the distance it takes for your food to get to you, which makes it FRESHER!